In support of Plastic Free July, we’re catching up with a few Kiwi businesses that are determined to improve sustainability in New Zealand. GoodFor allows customers to fill their pantries without the wasteful and environmentally-damaging packaging that usually goes hand-in-hand with grocery shopping. We talk to James Denton, Managing Director, for some insights into the environmentally-friendly business. The realisation that the world faces a “catastrophic plastic waste” issue is what drove James Denton to open GoodFor; a plastic-free wholefoods refillery. At Goodfor, customers bring their own reusable storage containers and fill them up with the bulk foods on offer. These range from baking needs to nuts, herbs and spices and cleaning staples. The store also offers a range of reusable storage options, such as stackable stainless steel lunch boxes, glass jars and organic cotton bags. You might think that someone who has created a business with a core focus on sustainable shopping would have grown up living and breathing sustainability, but James says he only started using reusable bags three years ago. Admittedly fairly new to the movement, he is making up for lost time. 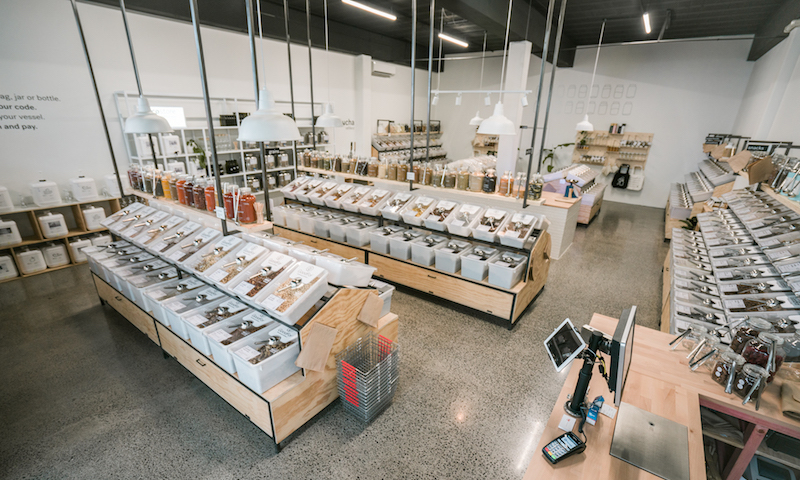 He opened up his “ultimate packaging-free store” in Grey Lynn after struggling to find anywhere to shop package-free. It turns out, he’s not the only one who was looking for a more environmentally-friendly shopping solution. Goodfor can now be found in two Auckland locations, as well as online. Two more Auckland stores are coming in the next couple of months, and a store in Wellington is also in the works. “Our customers are incredibly self-aware, intelligent people who are grounded and understand the importance of preservation. They care about the future and those who will be involved in that future, regardless of whether they are part of it or not,” says James. Goodfor’s motto is that sustainability starts with a packaging-free pantry, which can take some serious time to build. This attitude of caring inspired Goodfor to team up with Trees for the Future, funding a tree planting every time a customer shops with them. James knows that what we do now will make a huge difference in the future. In 20 years, he would like to see New Zealand as a leader in sustainable living. “I would expect the majority of houses and commercial buildings to be carbon neutral, energy efficient homes that also power our transport. Plastic waste will be a thing of the past, our economy will be thriving off of innovative sustainable industries. If you want to learn more about how you can reduce single-use plastic, check out the Plastic Free July resources. The post A sought-after solution to a catastrophic plastic waste issue appeared first on Xero Blog.